DO-95921-45 was succesfully added to your cart. Applications: Sterile fill and transfer, cell harvest, media processing, sanitary peristaltic pumping, production filtration and fermentation, bioreactor process lines, and pharmaceutical delivery. Characteristics: Excellent flexibility, long pump life, non-yellowing, tasteless and odorless, nontoxic, translucent. Certifications: Elastomer is FDA-compliant and meets USP Class VI, EP 3.1.9, and ISO 10993 biocompatibility criteria. 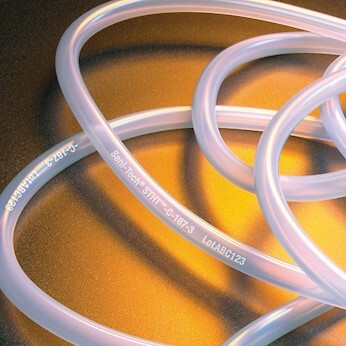 Tubing is manufactured and packaged in a certified cleanroom. Temperature range: –80 to 500°F (–62 to 260°C). Sterilize: Autoclave, ethylene oxide, or gamma irradiation (up to 5.0 Mrad). Applications: sterile fill and transfer, media processing, sanitary peristaltic pump tubing, general laboratory use, cell harvesting, and liquid chromatography. Characteristics: withstands repeated autoclaving, ultra-flexible, smooth surface for low adhesion, tasteless, odorless, nontoxic, and translucent. Certifications: Elastomer is FDA-compliant and meets USP Class VI, EP 3.1.9, and ISO 10993 biocompatibility criteria. Tubing is manufactured and packaged in a certified cleanroom. Temperature range: -80 to 500°F (-62 to 260°C). Sterilize: Autoclave, ethylene oxide, or gamma irradiation (up to 5.0 Mrad).